Make it to New York and you’ll make it anywhere. 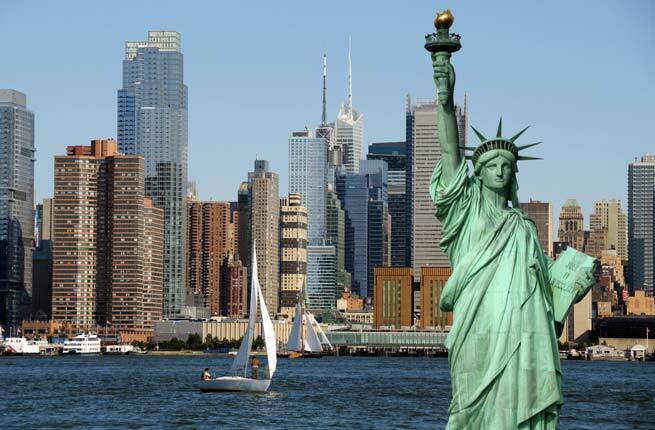 The iconic Statue of Liberty is certainly a must-never-miss-out-on as you travel to New York. This is the most known statue in the entire world, and gazing out from the Lady Liberty’s crown (which is the lookout area) will surely make your trip worthwhile. New York city is known for the most beautiful hotels and Manhattans night life. Weather your flying into JFK, Newark, LGA, or even into Philadelphia, Business or First class flights to New York will enhance your business or leisure trip. Check out our recent fares negotiated and fill in your trip details to receive a quote for your business or first class trip. Fares are total amount after taxes. Starting prices are based per traveler, including taxes and fees. One way flights are up to 50% less. Prices are subject to change and depend on availability at time of booking. No fare can be guaranteed until a ticket is issued.